The customer journey is no longer just about a trip to the mall or a click of a mouse. Today’s consumers use a variety of online and offline channels along their path to purchase and have come to expect a seamless experience from start to finish. Gaining a panoramic view of the customer across touchpoints has long been the marketer’s holy grail, but now it’s an imperative for success. Yet capturing that complete picture has been elusive and laden with obstacles: leveraging first-party data, merging activity across multiple channels and devices, and resolving customer identity. These are the stepping stones to knowing your fast-moving, multi-screening customers on a one-to-one basis. Signal wanted to find out where marketers stood in their quest to unlock the coveted single view of the customer and gain insight into the entire customer journey. In March 2015, Signal conducted a global online survey of 171 brand and agency marketers in the U.S., Europe, Asia, Latin America and the Middle East, spanning more than 17 verticals. For most brands, collecting and matching siloed and fragmented engagement data remains a nearly-impossible task. 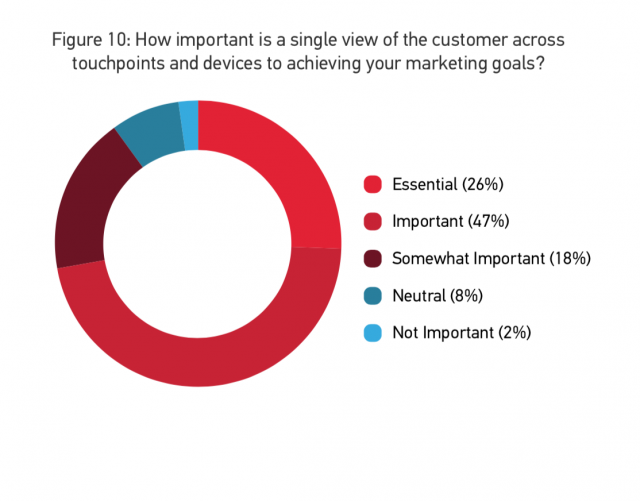 An overwhelming majority of marketers know that building a unified view of the customer is essential to their ability to deliver true one-to-one marketing. But only a tiny sliver of marketers have reached that sought-after goal. 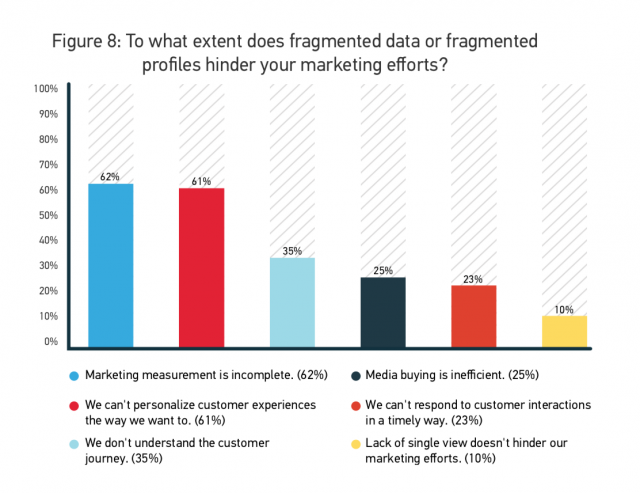 Data fragmentation is a central obstacle towards achieving a full, unobstructed view of customer engagement, with over half of marketers saying incomplete or disconnected data hinders critical goals such as marketing measurement and personalization. Despite the challenges, marketers rank cross-channel identity and a unified view as a critically important prize that will allow them to offer superb user experiences, strengthen their customer relationships and increase the return on their marketing investments. 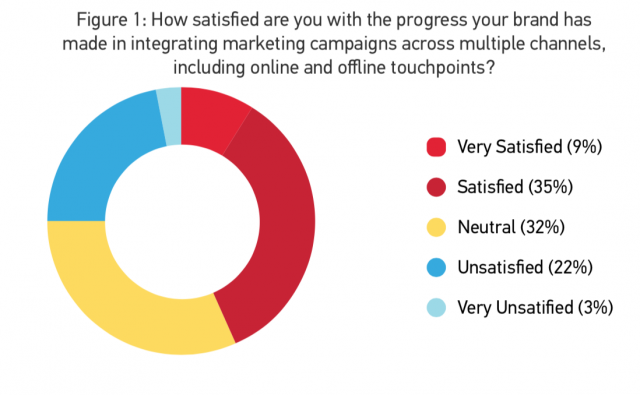 These survey results make it clear that for marketers seeking a full, unified view of their customers across channels and devices, building a strong data foundation is a must. That means collecting and matching first-party data in a centralized hub should be a top priority. In addition, taking a strategic approach to resolving customer identity, and building up lasting profiles and matching capabilities as an ongoing process should be emphasized. Modern marketers find themselves caught between a rock and a hard place: On one hand, they realize that customers expect to be instantly recognized and understood, no matter the touchpoint. Marketers want to optimize their marketing mix and experiment with new methods for delighting customers with personalized and seamless experiences. On the other hand, marketers’ ability to see the entire customer journey has been severely constrained by technology that wasn’t built for the realities of a cross-channel world. The typical brand has a siloed technology stack that is not designed to fully gather and centralize data in order to drive broad insights and power key cross-channel capabilities, such as measurement, attribution, media targeting, content personalization and ad message customization. The result is fragmented data and multiple, incomplete customer profiles. Marketers can’t accurately measure cross-channel campaigns, because they can’t attribute a customer’s behavior to certain channels and therefore cannot fully understand the shopper’s path to purchase. For example, many marketers aren’t collecting sufficient mobile data, or aren’t merging mobile data with web data. As a result, they can’t know with certainty whether a customer engaged with mobile, or with both mobile and web, or which of the two channels triggered conversion. How marketers approach customer data and identity from brand and agency marketers across the U.S., Europe, Asia, Latin America and the Middle East, spanning more than 17 industry verticals. Five key insights that reveal the secrets marketers should know in obtaining a 360-degree view of their customer journey. Four action steps marketers can take to overcome their challenges and create a single view of the customer. Insight #1 A unified customer view remains out of reach, keeping marketers stuck at the cross-channel starting line. The rest are still struggling with the thorny web of challenges surrounding the collection and merging of their data across devices and channels. 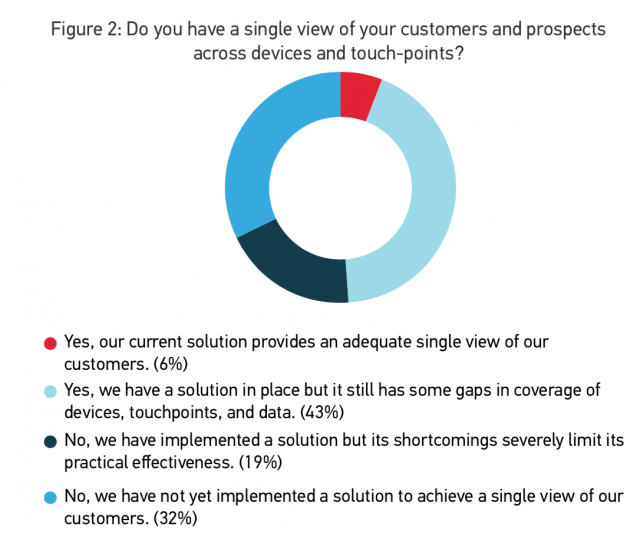 Nearly two-thirds say that gaps in cross-channel data collection or severe shortcomings in their solutions have hindered their ability to achieve the complete customer view that they’re seeking. And 1 in 3 have yet to even put a single view solution in place. Insight #2 Current approaches to a unified customer view are complex to implement and fail to plug the gaps. While marketers have yet to reach the nirvana of a unified customer view, for many, it’s not for lack of trying. Without a flexible, comprehensive solution that can be customized for their own data needs, customers and applications, marketers are cobbling together in-house and third- party tools that are filled with daunting complexity and are frustratingly incomplete. These piecemeal combinations typically have glaring gaps in data, weighing heavily towards traditional, browser-based and messaging sources and leaving marketers flying blind in other key channels that are growing in importance as consumers move away from desktops. For example, less than 40% of marketers are able to collect and integrate mobile app data, and half are unable to connect their CRM data. Other offline channels, such as point-of-sale, call center and kiosk, have gotten the least attention: Only one-quarter or fewer respondents can currently integrate such data, despite the potential to wow consumers as they move between digital and physical environments. [Fig. 4] Notably, while brands are investing heavily in media buys, nearly two-thirds still cannot measure the impact of ad impressions in the customer’s journey — so their true return on that investment is unclear. Insight #3 Gathering and merging data as customers interact across touchpoints remains a significant hurdle. Marketers would love to just press an “easy button” and have a single customer view solution magically appear. Instead, they report that nearly every aspect of current solutions has proven to be unimpressive or mediocre; and issues remain even with foundational data collection and merging capabilities. 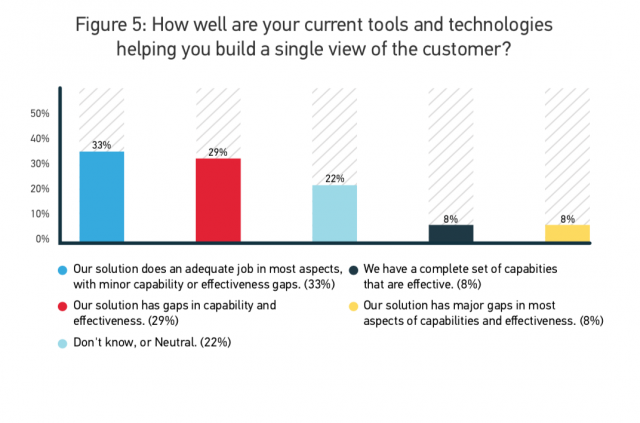 Of those with solutions in place, a mere 8% of respondents say their tools are doing a good job in helping them develop a unified view. [Fig. 5] Instead, most marketers simply hobble along with solutions they have significant issues with, because they haven’t found a better alternative. 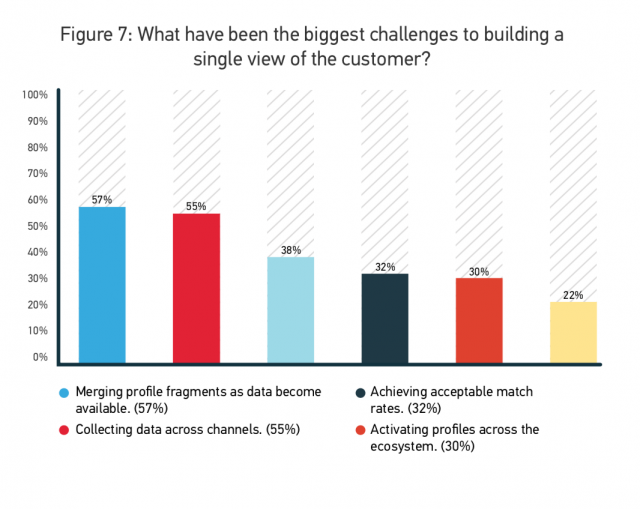 That means the majority of marketers are clearly being held back: merging profile fragments as data becomes available is essential for providing context to real-time interactions with always-on customers, but a majority of marketers (57%) say it is their top challenge. [Fig. 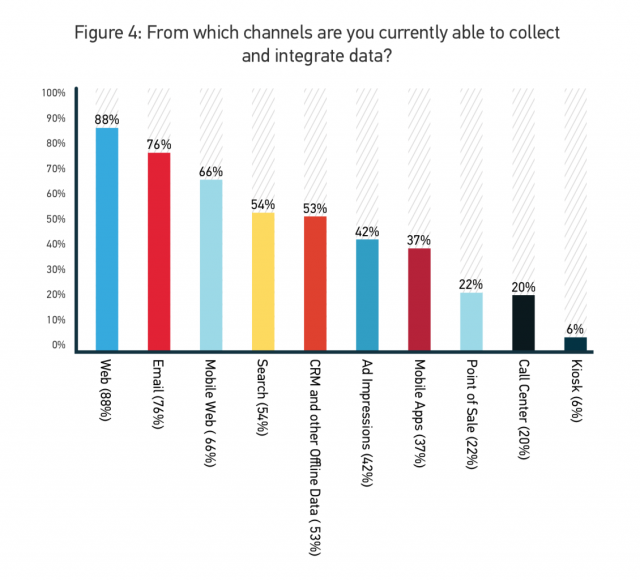 7] Cross-channel data collection is essential to creating full, deep profiles, but it also remains a big challenge for most respondents (55%), so they lack the rich data sets needed to take the next step towards a unified customer view. Insight #4 Marketers are focused on mastering data collection and cross-channel measurement before graduating to more advanced use cases. Marketers want to understand the customer journey across channels in order to know what offers are working; what messaging works best; and to buy media more efficiently, among other goals. The problem is, marketers are still struggling with the data basics, and so they are unable to progress to more advanced use cases. For example, if they aren’t gathering the necessary data from the right channels, marketers are left with fragmented data and profiles that hinder downstream activities such as measurement, personalization and targeting. A whopping three-quarters of marketers are still struggling with the fundamentals of data collection: getting the right data from the right channels. 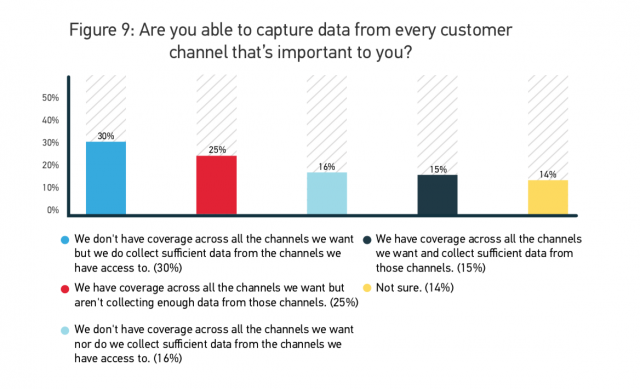 To move towards a single customer view, marketers need coverage of all the channels that are relevant to their marketing efforts, and they need collection of sufficient data points from each of those channels. Insight #5 Marketers’ eyes are on the cross-channel identity prize. Marketers have observed the transformational changes in customer behavior since the debut of the web, Google, smartphones, tablets, and social media. But how can they provide the right message in the right place, right now, if they don’t fully understand whom they’re speaking to? Knowing a single view is important goes hand-in-hand with the recognition of the business benefits that come with having broad and deep insights into the customer journey. 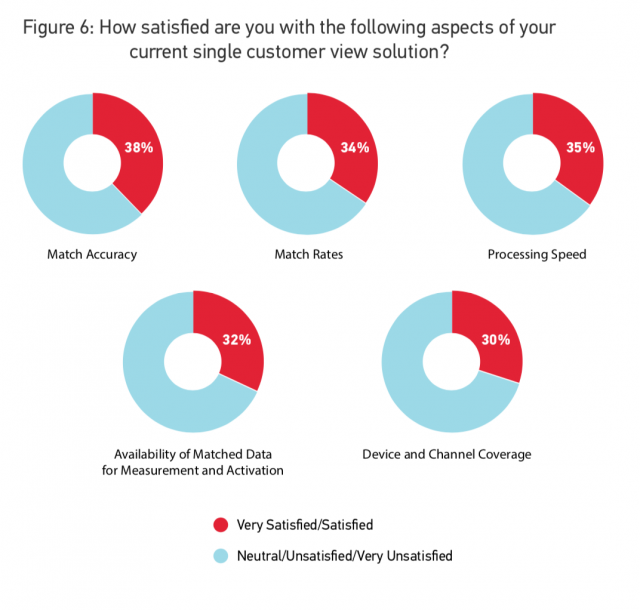 Marketers are clear about the value that a unified customer view will deliver. 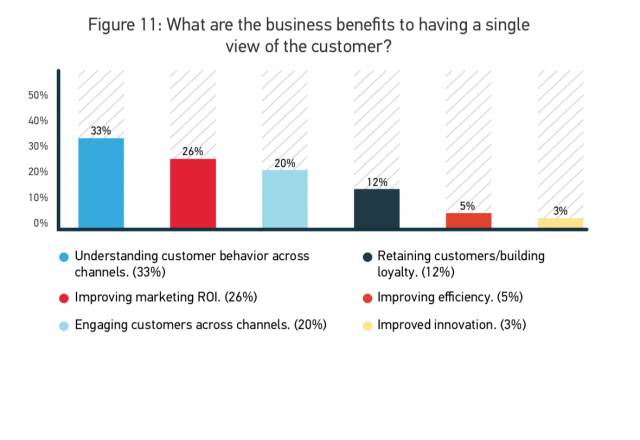 When asked about the benefits, respondents’ chose the following as their top answers: understanding customer behavior across channels; improving ROI, engaging customers across channels; and retaining customers/ building loyalty. [Fig. 11] In short, despite all the challenges, they believe that a unified view is a dream worth chasing because it will positively impact their company’s bottom line and empower them to wow their customers. 1. Create a roadmap for cross-channel marketing. A single customer view is not created in a vacuum. It is the foundation for a larger cross-channel marketing strategy, and the ultimate value of a unified lens is how the view is applied to your business. Prepare for a single customer view by defining your marketing and customer experience goals and objectives, the tactics and analytics required to execute on the strategy, and the roadmap for how your cross-channel marketing capabilities will develop over time. Take a pragmatic approach to planning and implementing a cross- channel identity solution by breaking down the long-term effort into smaller projects that show incremental ROI at each stage. For example, in the case of powering insights with enhanced identity capabilities, start with initiatives that will yield immediate value, such as visibility to new channels or tactics, then map the customer journey, and from there ladder up to advanced solutions that support cross-channel marketing, such as attribution and real time analytics. 2. Determine the right data sources and data points. Once you have identified the strategic applications of a single customer view, cross-reference the data sources and data points that are available for collection by your organization with the data requirements of the marketing and analytics use cases you plan to execute against. It’s important to understand the difference between the sources of the data you collect and the data points that you will be gathering. Keep in mind, being able to collect the wrong data from the right source doesn’t help you — and the reverse is also true. For instance, you may wire up your mobile apps to gather data on downloads, but does mobile app data serve the use cases you seek to drive? And are downloads the data points that will move the needle, or do you need information on how customers are using the app? You need both the right data sources as well as the right data points to provide you with the full, holistic data profiles that you need. 3. Be ready to integrate on the tech side. The bottom line is that no off-the-shelf single-view solution does it all. The technology options are still siloed and brands’ requirements are extremely diverse. A single solution doesn’t exist, so you have to be ready to develop a solution based on multiple components. It’s important to design and build a solution that meets your specific needs, not someone else’s version of a single customer view. Start with a laser focus on the strategy, use cases, and requirements. But it’s also extremely important to understand your own company’s preferences for solution development: Do you like point solutions or larger technology stacks? 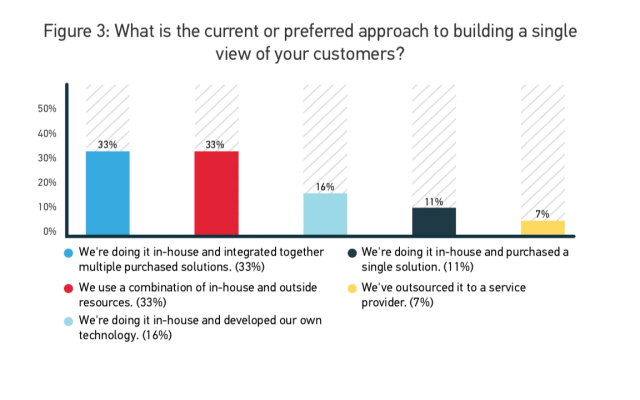 Do you prefer to build solutions in-house? Do you want to leverage third party services or your own staff? 4. Benchmark and monitor over time. Moving towards a single view of the customer is a long-term, ongoing process, in which you build up profiles and capabilities over time — rather than a one-off project that you set up and leave behind. That means you need to benchmark your customer-view capabilities, monitor progress and address learnings at every step along the way. 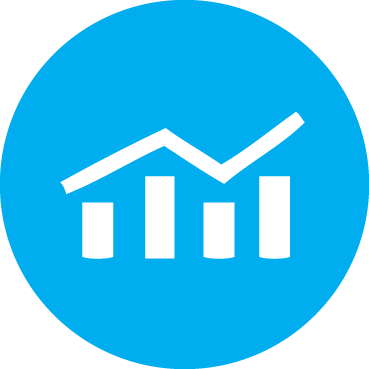 Identify the key success metrics for your customer-view solution, both in terms of operational capability and support for cross-channel marketing initiatives. Track data volumes, sources, match rates, processing speed, profile depth, and which data is activated for analytics and measurement. Cross-channel identity is the new currency for digital marketers in the race for always-on customers. Data provides information about your customers, but a unified view of the customer provides the context necessary for unlocking marketing ROI and delivering a next- generation consumer experience. Truly knowing your customers, recognizing them and anticipating their needs as they move from mobile device to desktop to brick-and- mortar store and beyond – that’s the marketing challenge of our time. Few brands have come close to reaching this goal and most are stuck at the starting line. The larger mission of cross-channel marketing remains a work in progress, while marketers seek better solutions for turning billions of disparate customer interactions into lasting profiles that are continuously updated as customers engage with brands in real time. The critical capability for achieving competitive advantage is building clean, matched profiles that marketers control and can use however they want, wherever they choose. Fortunately, advanced technologies have emerged, offering more comprehensive options for leveraging big data and resolving customer identity in privacy-safe ways. New platforms are providing brands with flexible, centralized data hubs capable of ingesting, merging and matching cross-channel data from online and offline environments in real time. Ecosystem-neutral choices provide an alternative to walled- garden identity solutions by allowing brands to maintain control over their first-party data and enabling them to activate matched profiles with vendors across the marketing ecosystem. The stakes are high. And despite the challenges, marketers know that solving the identity puzzle is well worth the effort. The brands that see it through and overcome the obstacles to a unified customer view will be ready and empowered to wow their customers with great experiences now and in the future.